Maxine Clair, award-winning author of the critically acclaimed short story collection Rattlebone and the novel October Suite, has assembled a deeply inspirational yet practical book to help readers access their inner creativity. 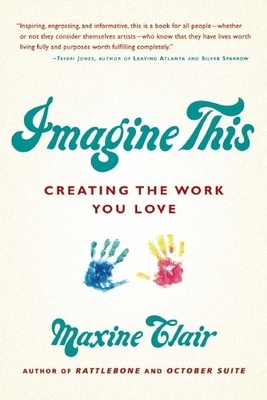 Imagine This is a beautifully written set of deeply personal stories from which Clair draws examples of how we can be aware of the now, keep ourselves motivated, and create work of which we are proud. Imagine This explains how some of us consciously choose the vehicle through which we express our magnificence -- be it business, art, science, or other -- while others of us have dutifully plied a trade in arenas that society has suggested are worthwhile, with self-expression only fixed on a hobby. Both, Clair maintains, can contribute to a good life. Occasionally, however, a moment comes that is sufficiently insistent on deep examination. In that moment we float the possibility for expression of a greater self. Imagine This shows readers how to be aware of these moments and how our inner creativity is always seeking an outlet. By combining captivating memoir with step-by-step advice, Clair helps us find and develop our own unique and personal creative outlets. Maxine Clair is a poet, short story writer, and novelist. Born and raised in Kansas City, Kansas, she had a career in medical technology as chief technologist at a D.C.-area children's hospital before pursuing and achieving her MFA at George Washington University.